October Revolution Day was the most significant public holiday in the Soviet Union. 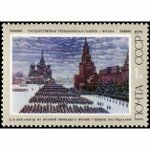 It was marked on November 7 (due to the difference between the old Julian calendar and the new Gregorian calendar) with a large-scale military parade held at Red Square in Moscow. When the Soviet Union entered the Second World War in 1941, it was decided not to cancel the annual parade despite the fact that Moscow was besieged by Germans. On November 7, 1941, the troops marched across Red Square and left it straight to the front line situated less than a hundred kilometers from Moscow. The military parade of 1941 had an enormous impact on the morale of the army and all the people in the Soviet Union at the early stage of the Great Patriotic War (in other words, the Eastern Front of WWII). That is why its anniversary was designated as a Day of Military Honor. Russia does not celebrate October Revolution Day as a public holiday anymore, but November 7 remains an important date in the country's calendar.